Welcome to Red Barn Training for Beauty. Since launching in November 2012, the Red Barn Studio has rapidly become a success story, with its unique concept in hair and artwork delivered by two highly recognised professionals, Deena Maddock and Alice Guise. 2013 then brought an opportunity to expand the Team when Carol Doherty became available to head up training and beauty treatment services. 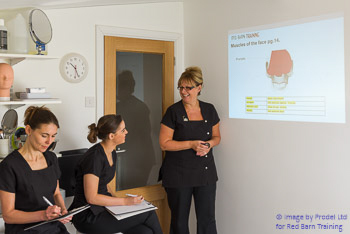 With over 25 years' industry experience and 12 years' experience teaching Beauty Therapy as a fully qualified Senior Lecturer in Further Education, you can be assured that you will receive the best quality training with the unique, relaxed and highly professional 'Red Barn' twist. Carol's passion and commitment to the beauty and education industries have earned her many 'Grade 1' lesson observations, including under OFSTED inspection conditions. Carol is also a fully qualified Internal Verifier vastly experienced in developing innovatively-delivered courses to fully meet the Awarding Body course requirements. So at Red Barn Training you will be taught by a true industry and education professional. Whether you are looking to simply add to your skills for personal interest or want recognised qualifications to embark on an exciting new career in the industry, come and see the Red Barn difference! Follow this link to see What People Say about us.